The featured speaker of the San Marino City Club’s April 16 meeting is Mr. Todd Barber, Jet Propulsion Laboratory senior propulsion engineer. The title of his talk is, “The Voyagers: Humanity’s Most Distant Explorers.” His talk will explain how the Voyagers embarked on an epic journey of explorations in 1977, exploring all four gas giant outer planets – Jupiter, Saturn, Uranus, and Neptune. Following a final picture of the solar system from beyond Neptune, both spacecraft commenced the Voyager Interstellar Mission (VIM) with the ultimate goal of crossing the heliopause, a boundary separating the near-sun system with interstellar space. The future of Voyager will be discussed as well, including the infamous Voyager Gold Record. Sounds as if it’s science fiction, but come hear the real story of this fantastic voyage. Mr. Barber is wrapping up two decades as lead propulsion engineer on the Cassini mission to Saturn, following part-time work on the Mars Exploration Rover (MER) mission, Deep Impact mission, and the Mars Science Laboratory (MSL) mission, which landed the large rover Curiosity on the red planet on August 5th, 2012. Cassini was launched on October 15, 1997 on its two-billion-mile, seven-year journey to the ringed planet. It “took the plunge” into Saturn’s atmosphere in 2017 after thirteen years in orbit around Saturn. The MER team launched twin rovers to the red planet in June and July of 2003, and Spirit and Opportunity lasted six years and fourteen years, respectively, into their three-month missions. Todd also worked as the lead impactor propulsion engineer on Deep Impact, which successfully crashed into Comet Tempel-1 on Independence Day, 2005, at twenty-three-thousand miles per hour. Todd recently completed working on the Dawn mission, an ion propulsion mission to the two largest main-belt asteroids, Vesta and Ceres. He also recently began supporting the Soil Moisture Active Passive (SMAP) mission. Much to Todd’s delight, he is now supporting the Voyager mission as well, more than forty years after launch. Mr. Barber worked on the Galileo project for over seven years and his primary responsibility was getting Galileo into Jupiter orbit on December 7, 1995. Todd also worked part-time on the Space Infra-Red Telescope Facility (SIRTF) mission and on the Stardust mission, as well as the Mars Sample Return mission and a Mars airplane study. 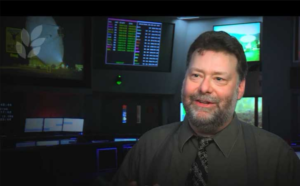 Todd received NASA’s Exceptional Achievement Award in 1996 for his work on Galileo. In 2018, Mr. Barber was also honored to receive NASA’s Exceptional Public Service Medal for heading up Cassini’s propulsion team for nearly two decades. Mr. Barber is a native of Wichita, Kansas, and attended MIT between 1984 and 1990, obtaining B.S. and M.S. degrees in aerospace engineering, with a humanities concentration in music. He is also a composer of church choral music, with two pieces published to date. His hobbies include singing charitably and professionally, playing the piano, snagging degree confluences (exact integer latitude/longitude intersections), visiting all the U.S. tri-state corners and national parks, playing basketball (though it’s been a while), and amateur astronomy. City Club members please RSVP below. Alternatively, members may RSVP on the City Club website, or by emailing cityclubrsvp@gmail.com, or by calling (626) 765-4411 and leaving a message with the member’s name and the full name of any guest whom the member wishes to invite. Adult guests will be welcome at this event for $30.00 ($15.00 for children) payable at the door by check or credit card. For more information on this event, please visit the City Club’s website at www.sanmarinocityclub.org. The San Marino City Club is a non-profit civic organization that since 1926 has been dedicated to obtaining for the citizens of the San Marino the best civic, educational and cultural services and facilities possible, and to encouraging and promoting the highest standards of citizenship among its membership. City Club membership is open to residents of the San Marino Unified School District, officials of the School District or the City of San Marino, and persons who conduct their business or profession within the School District. Membership provides the member with eight dinner meetings that feature timely, important, and informative speakers on a wide variety of subjects, and the opportunity to meet many of San Marino’s wonderful citizens. More information on City Club (including information on how to join the Club) is available on the City Club’s website at www.sanmarinocityclub.org.